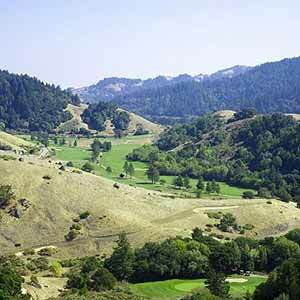 Marin’s San Geronimo Valley is an attractive region of redwoods, grassy hills, and small towns. To offset the increased development of this area, the county set aside three small parks among the newly-developed golf course, mansions, and schools. 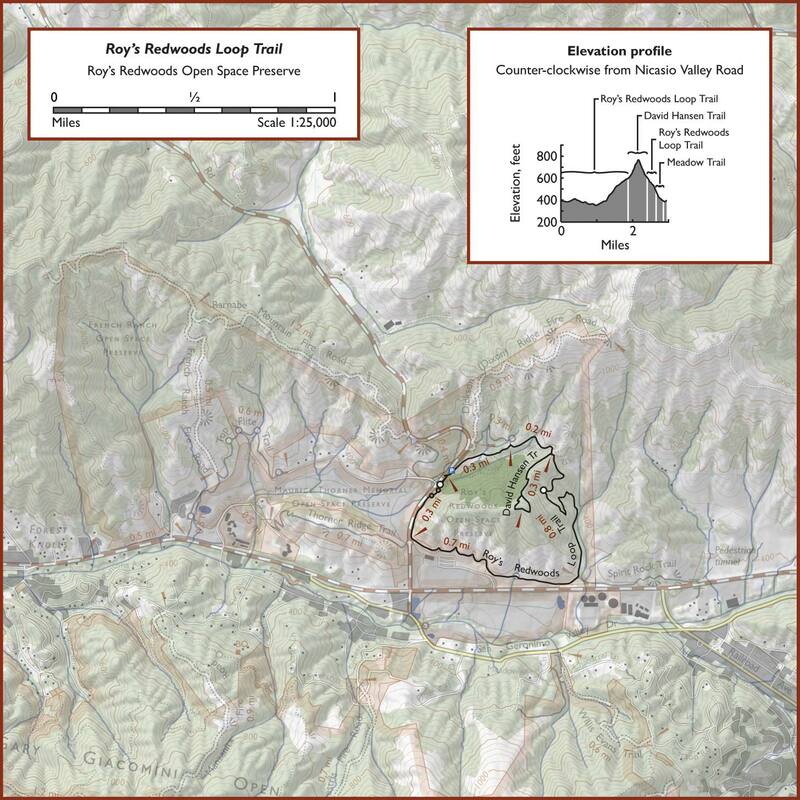 One of these parks is Roy’s Redwoods, which features a small, isolated redwood grove growing around a creek at the base of a small hill. Part of the grove has been logged, with several large stumps visible. 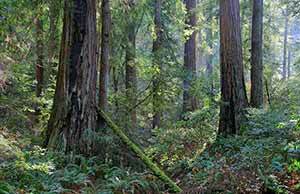 The remainder appears to be old growth even though it has a rather dark, disheveled appearance, with a dense canopy and a lot of small trees, features usually associated with second-growth groves. However, the presence of some pretty good-sized trees and the lack of stumps in most areas suggest that most of the grove has not been logged. Given that the grove was part of a ranch, then a hippie commune in the 1960s, it’s certainly not in pristine condition, but is still an interesting and enjoyable place to visit. 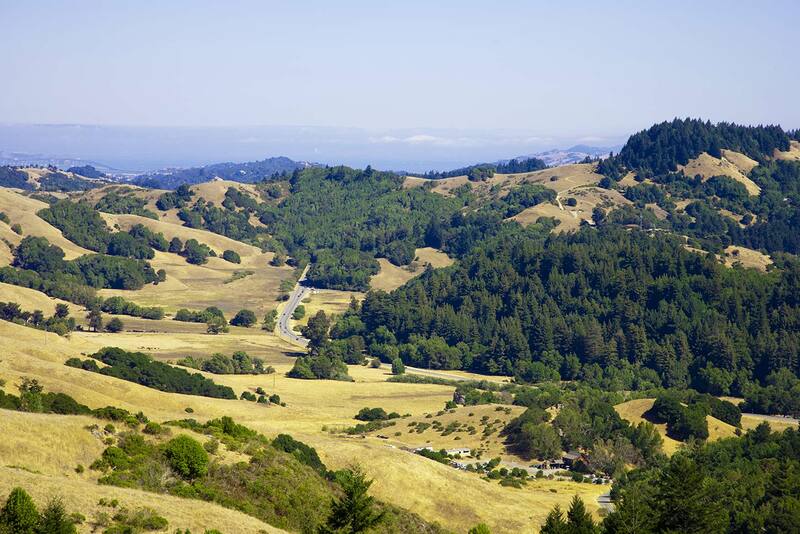 If you just want to see the redwoods, the most enjoyable thing to do is just park on Nicasio Valley Road and wander around on the faint unofficial trails. 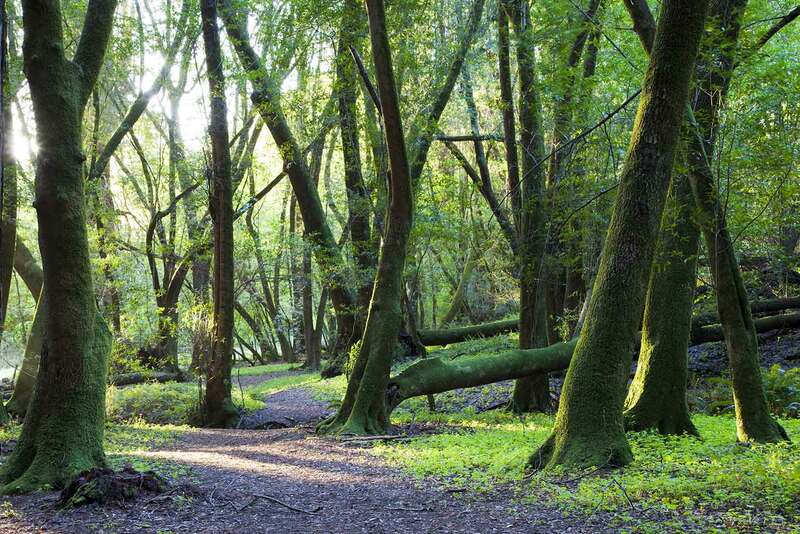 None of the official trails actually go through the grove, but there’s a fairly attractive loop trail around the preserve that’s worth checking out. This loop is described below. Roy’s Redwoods is fairly popular, although it’s usually not a problem to find a place to park. Just to the east of Roy’s Redwoods, and connected to the preserve by a trail, is a horse stable. The trails in the preserve are heavily used by horses except in the winter, when they’re only open to hikers. 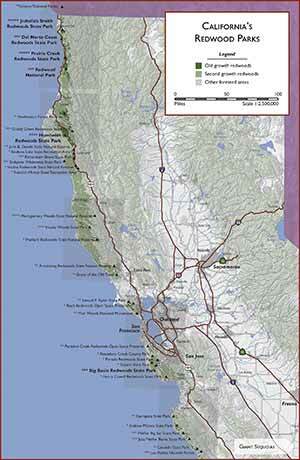 The park has an unusually high amount of poison oak for the area. 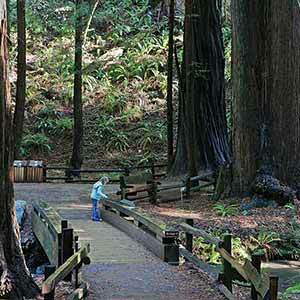 The Roy’s Redwoods Loop Trail circles the small hill in the center of the reserve. 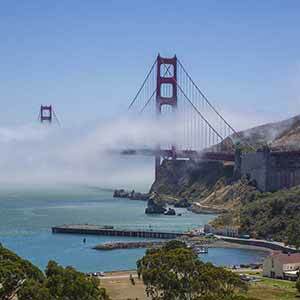 The first half of the loop runs alongside Nicasio Vallley Road, the San Geronimo Golf Club, and busy Sir Francis Drake Boulevard. This part of the hike isn’t especially enjoyable, mainly because of the traffic noise. 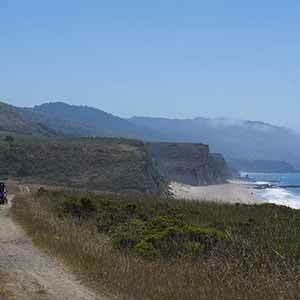 However, the route becomes surprisingly peaceful and the scenery improves a lot once the trail turns left and starts climbing through a shallow canyon. The trail enters a pleasantly wooded area and winds its way uphill. 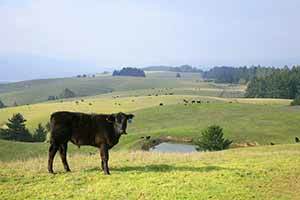 At the top of the hill, the woods give way to sunny grasslands. Two spur trails to the right lead to scenic viewpoints. 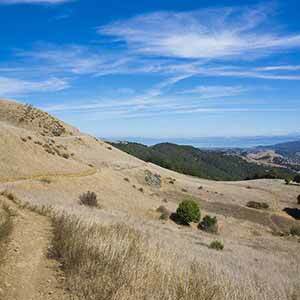 To the left is the David Hansen Trail (also known as the Roy’s Redwoods Nature Trail), another spur trail that passes by some small redwoods and climbs to the top of the hill. This trail isn’t especially interesting and is less scenic than the main loop trail. The Roy’s Redwoods Loop Trail begins its descent. Ironically, though, it avoids the actual redwoods. 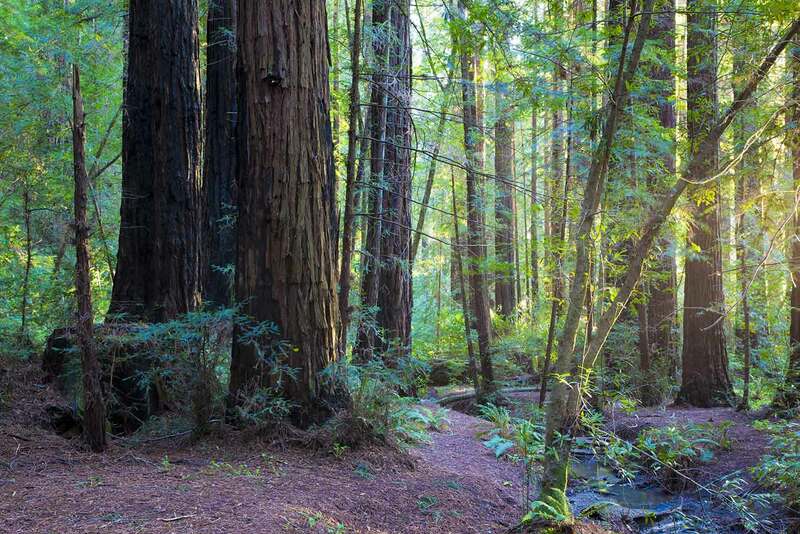 To see the redwoods turn left at the Meadow Trail, which descends to a redwood-covered flat, the highlight of the walk. Passing briefly hrough the redwoods, the trail enters a redwood-bordered meadow. To really see the grove you’ll have to leave the Meadow Trail and explore the unofficial trails that run through the grove. It’s hard to get lost because the grove is small and you can always head for the near-constant traffic noise to get back to your car. Also in the preserve, but not part of the hike shown on the map above, is Dickson Ridge Fire Road, which from the meadow climbs at a steep and unrelenting 17% grade for 780 vertical feet, eventually offering superb views over the rolling hills and the valley below. The trail dead-ends at private property. 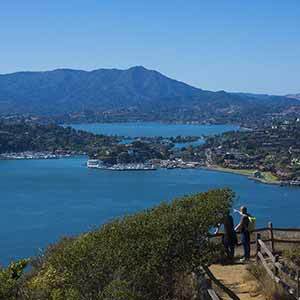 The Barnabe Peak hike in nearby Samuel P. Taylor State Park is similar but more rewarding. 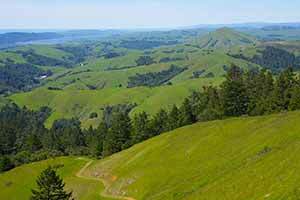 Another hiking option is an enjoyable 3.5-mile loop hike through Roy’s Redwoods and the two neighboring parks, using the Barnabe Mountain Fire Road (which passes through private land, but is open to hikers), French Ranch Fire Road, and Thorner Ridge Trail. 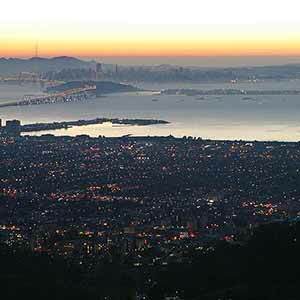 This scenic walk has 770 feet of climbing.